The Psilocybe Galindoi Truffle Spore Print can be used to inoculate a sterile growing medium, giving you the ability to grow some very potent magic truffles for yourself. This is a strain known for its high psilocybin content, resulting in vivid hallucinations and deep, introspective thought. Very eye opening indeed! These truffle spore prints are exclusive to Zamnesia! Psilocybe Galindoi Truffle Spore Prints: Grow your magic truffles at home! Psilocybe Galindoi is a potent strain of magic truffles first found in the forests of Mexico. It was mistaken for Psilocybe Atlantis, another potent strain, but upon further investigation, was found to be a whole new type in itself. This limited and exclusive spore print will give you the resource you need to grow this illustrious magic truffle yourself, sampling some of this Mexican magic first hand. 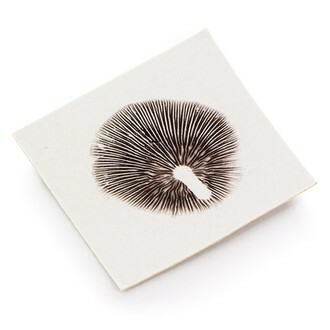 A magic truffle spore print contains the spores used to inoculate a sterile growing medium, eventually resulting in the growth of magic truffles. Each of our magic truffle spore prints has been created from a highly-bred strain that has been specifically selected for its ability to produce truffles. These are exclusive to Zamnesia, and limited in number. Once they are gone, there will be no more. To learn how to use a truffle spore print, check out our handy growing manual. All magic truffles contain psilocybin, the main psychoactive compound responsible for the psychedelic effects. Psilocybe Galindoi contains a rather large amount of psilocybin, making it widely regarded as a very potent strain of magic truffles. A normal dose will likely alter perceptions of space and time, cause both visual and auditory hallucinations, and cause introspective thought. This often results in feelings of euphoria, spirituality, and understanding as you look at things from a different perspective. Spore prints can be stored for years as long as they are kept in a cool, dark, and dry environment. Product as described, fast and discreet shipping. Thank you! Printing spore seems to be perfect! The fungal colonization ups normaly, without contaminations. PERFECT!!!! Print arrived in good condition with no signs of contamination. Would recommend to budding mycologists.